life mystery #25,678: is he having a bad day, or is he just a jerk? This weekend, we wanted to get stuff done at home. We were so happy that we weren’t out of town. We planned to paint two of the bathrooms, clean out cabinets, and dust everything. A nice little Saturday. No Bed, Bath, and Beyond, no Olive Garden, no Home Depot. It was, however, going to be a productive day. In order to be productive, a big breakfast was in order. We always order the same things, and no one ever complains. They get waffles and bacon, The Man gets a bacon egg and cheese, and I have my standard. It’s been my standard since the second time I ate there. Chicken melt plate, double hash browns scattered. A few things have changed over the years. I now have to clarify that I do want wheat toast (no offense to Texas, but your toast isn’t as good) and I would like the grilled onions. So we go about our breakfast. I’ve even got a little notepad out, so we can make a specific shopping list. Does anyone else end up at Lowe’s with only one project in mind, only to leave with a new list of eleventy billion important things that “need to be fixed?” It’s sort of like Target. We can’t stick to a budget. 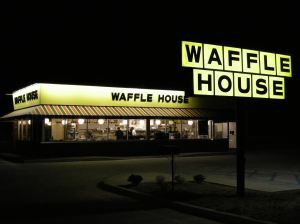 Because this was a Saturday morning, all of the tables at Waffle House were full, and a couple of people waited for one to become available. The Waiting Couple (TWC) must’ve been hungry. While they were waiting, Single Male(SM) walked in. I’m not sure of his marital status or anything. I’m just saying that he was alone for breakfast. He came in and headed straight back to the counter area, where he’d spotted a vacant seat. The man part of TWC grabbed his wife, stood up, and hauled tail to catch up with the SM. “WE WERE WAITIN’.” He had a loud, booming voice that caught everyone’s attention. SM looked a little flabbergasted, but he conceded, and walked to another table. His new table was a counter with three available seats. T(formerly)WC got to the seat (s?) that SM had supposedly stolen, only to find that there was only one chair available. They huffed and puffed, walking back to the waiting area. As they passed him, SM said “Would you like these seats? There are three here. I wasn’t trying to cut the line or anything. There’s only one seat back there in the corner.” They weren’t thankful. They weren’t apologetic for their part in the confusion. They sat down in the new seats as if they’d finally found what was rightfully theirs. They were obviously still mad at SM. A few glares and stares proved it to be true. T(formerly)WC wasn’t even trying to hide their disgust. SM’s dad returned from the bathroom and shook his son’s hand. Breakfast at this Waffle House was clearly a regular thing. In spite of that fact, though, SM was willing to give up his seat for the people who’d been waiting longer. Somehow those people never realized his honest generosity and respect for time spent waiting in line. They sat, slumped in their seats, regularly glaring at SM throughout their meal. They were so up in arms about SM being a line cutter, they never paid attention to the reasons he might be doing so. Why are we so quick to assume someone has bad intentions? I’m guilty. If someone uses the emergency lane to avoid standstill traffic on the highway, I immediately think, “CHEATER.” Maybe that guy’s wife is trying to avoid having their firstborn in the front seat. What about TWC? What could their story be? It’s likely that they never knew that SM ate with his dad. It’s likely that they don’t have a clue that he does that every week. Couldn’t they have been a little nicer, though? Maybe they were just having a bad day. Hell, I had one of those just today. I’m sure I was short with strangers, and I know I was short with my family. I tried and tried to keep a smile on my face. Some days just blow. Saturday might’ve been that day for TWC. There are lots of lessons here, but I can streamline it for ya. The chairs at Waffle House are meant for one person. Two people cannot fit. If TWC had realized that, none of this ever would’ve happened. This is my favorite so far!!!! This applies to so many things in life. Thanks Jenny!!!! I love this one, too, Jenny! Especially the part about why are people so quick to assume that others have bad intentions. Great article.